Firefighters search for the origin of a fire Thursday night at the rear of a residence at 835 W. Walnut St. in Hillsboro. 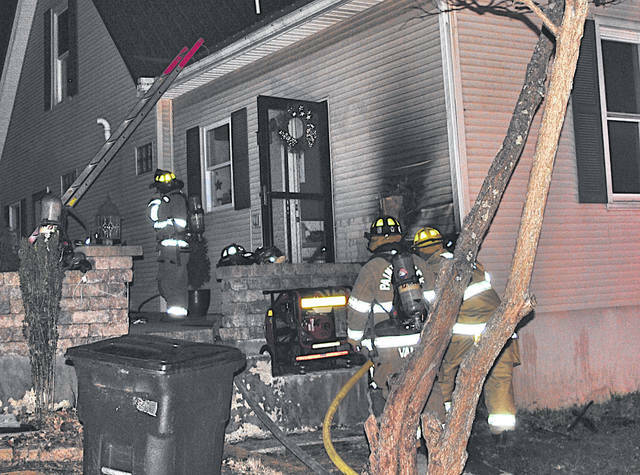 West Main Street was closed for more than two hours, but damage to a home caused by a fire Thursday night was minimal, according to Lt. Branden Jackman of the Paint Creek Joint EMS/Fire District. Jackman said his district received a call reporting the fire at 835 W. Walnut St. in Hillsboro at 8:54 p.m. He said that upon arrival firefighters found smoke showing from the back side of the residence, but the actual fire was located in the crawl space beneath the house, causing firefighters access issues. The home was owned by Jerry Walker. Jackman said the cause of the fire was undetermined as of Friday afternoon. But he said there was no indication that it was suspicious. Due to the type of fire, and because electric service to the house had to be isolated, the family was displaced, Jackman said. He said West Main Street remained closed until 11 or 11:30 p.m. Thursday. Paint Creek received mutual aid from the fire departments in Marshall, Lynchburg and Leesburg. Firefighters cleared the scene at 2:03 a.m.